The Trần dynasty (Nhà Trần, 陳朝, Trần triều) ruled in Vietnam (then known as Đại Việt) from 1225 to 1400. The dynasty was founded when emperor Trần Thái Tông ascended to the throne after his uncle Trần Thủ Độ orchestrated the overthrow of the Lý dynasty. The final emperor of the dynasty was Thiếu Đế, who at the age of five years was forced to abdicate the throne in favor of his maternal grandfather, Hồ Quý Ly. The Trần dynasty defeated three Mongol invasions, most notably in the decisive Battle of Bạch Đằng River in 1288. The ancestors of the Trần clan originated from the province of Fujian before they migrated under Trần Kính (陳京, Chén Jīng) to Đại Việt, where their mixed-blooded descendants established the Trần dynasty which ruled Đại Việt. The descendants of the Trần clan who came to rule Đại Việt were of mixed-blooded descent due to many intermarriages between the Trần and several royal members of the Lý dynasty alongside members of their royal court as in the case of Trần Lý and Trần Thừa, the latter whose son Trần Thái Tông would later become the first emperor of the Trần dynasty. Their descendants established the Tran dynasty, which ruled Vietnam (Dai Viet). Some of the mixed-blooded descendants and certain members of the clan could still speak Chinese, as when a Yuan dynasty envoy met with the Chinese-speaking Tran Prince Trần Quốc Tuấn in 1282. The first of the Trần clan to live in Đại Việt was Trần Kinh, who settled in Tức Mặc village (now Mỹ Lộc, Nam Định) who lived by fishing. After three generations in Đại Việt, the Trần clan became a rich and powerful family under Trần Lý, who was Trần Kinh's grandson. During the troubled time under the reign of Lý Cao Tông, the Crown Prince Lý Sảm sought refuge in the family of Trần Lý and decided to marry his beautiful daughter Trần Thị Dung in 1209. Afterward, it was the Trần clan who helped Lý Cao Tông and Lý Sảm restore the throne in Thăng Long. As a result, the Emperor appointed several members of the Trần clan for high positions in the royal court, such as Tô Trung Từ, who was an uncle of Trần Thị Dung, and Trần Tự Khánh and Trần Thừa, who were Trần Lý's sons. In 1211 the Crown Prince Lý Sảm was enthroned as Lý Huệ Tông after the death of Lý Cao Tông. By that time the Trần clan's position began to rise in the royal court. Having been mentally ill for a long time, the Emperor Lý Huệ Tông ultimately decided to cede the throne of the Lý dynasty to crown princess Lý Chiêu Hoàng in October of the lunar calendar, 1224. Ascending the throne at the age of only six, Lý Chiêu Hoàng ruled under the total influence of the commander of the royal guard, Trần Thủ Độ. Even the Empress Regnant's servants were chosen by Trần Thủ Độ; one of them was his 7-year-old nephew Trần Cảnh. When Trần Cảnh informed Trần Thủ Độ that the Empress Regnant seemed to have affection towards him, the leader of the Trần clan immediately decided to take this chance to carry out his plot to overthrow the Lý dynasty and establish a new dynasty ruled by his own clan. First Trần Thủ Độ moved the whole Trần clan to the royal palace and arranged a secret marriage between Lý Chiêu Hoàng and Trần Cảnh there, without the appearance of any mandarin or member of the Lý royal family. After that, he announced the fait accompli to the royal court and made Lý Chiêu Hoàng cede the throne to her new husband on the grounds that she was incapable of holding office. Thus Trần Cảnh was chosen as her successor. As a result, the 216-year reign of the Lý dynasty was ended and the new Trần dynasty was created on the first day of the twelfth lunar month (Gregorian: December 31), 1225. After the collapse of the Lý Dynasty, Trần Thủ Độ was still afraid that the newly established Trần Dynasty might be overthrown by its political opponents. He therefore continued to ruthlessly eliminate members of the Lý royal family. First the former emperor Lý Huệ Tông in the tenth lunar month of 1226, then other members of the Lý royal family were massacred by the order of Trần Thủ Độ in the eighth lunar month of 1232. Trần Thái Tông was enthroned when he was only eight-years-old. There were several rebellions in Đại Việt at that time, so Trần Thủ Độ had to devote all of his efforts to consolidating the rule of Thái Tông in the royal court and over the country. Right after the coronation of the Emperor in 1226, Nguyễn Nộn and Đoàn Thượng rose in revolt in the mountainous region of Bắc Giang and Hải Dương. By both military and diplomatic measures, such as sending an army and by awarding two leaders of the revolt the title of Prince (Vương), Trần Thủ Độ was able to put down this revolt in 1229. According to Đại Việt sử ký toàn thư, Thái Tông and his wife, the Empress Chiêu Thánh, did not have their first son for some time. This situation worried the grand chancellor Trần Thủ Độ because he had profited from similar circumstances with the Emperor Lý Huệ Tông in overthrowing the Lý dynasty. Therefore, in 1237 Trần Thủ Độ decided to force Prince Hoài Trần Liễu, Thái Tông's elder brother, to give up his wife, Princess Thuận Thiên, for the Emperor when she had been pregnant with Trần Quốc Khang for three months. After the royal marriage, Thuận Thiên was entitled the new empress of the Trần dynasty, while Chiêu Thánh was downgraded to princess. Furious at losing his pregnant wife, Trần Liễu rose in revolt against the royal family. Meanwhile, Thái Tông felt awkward about the situation and decided to become a monk at Yên Tử Mountain in Quảng Ninh. Finally Trần Thủ Độ successfully persuaded Thái Tông to return to the throne, and Trần Liễu had to surrender after judging that he could not stand with his fragile force. All soldiers who participated in this revolt were killed; Trần Thủ Độ even wanted to behead Trần Liễu but was stopped by Thái Tông. Fujian was the origin of the Trần ancestors who migrated to Vietnam under Trần Kinh along with a large amount of other Chinese during the Ly dynasty where they served as officials. Distinctly Chinese last names are found in the Tran and Ly dynasty Imperial exam records. Ethnic Chinese are recorded in Tran and Ly dynasty records of officials. Clothing, food, and language were all Chinese dominated in Van Don where the Tran had moved to after leaving their home province of Fujian. The Chinese language could still be spoken by the Tran in Vietnam. The oceanside area of Vietnam was colonized by Chinese migrants from Fujian which included the Tran among them located to the capital's southeastern area. The Red River Delta was subjected to migration from Fujian including the Tran and Van Don port arose as a result of this interaction. Guangdong and Fujian Chinese moved to the Halong located Van Don coastal port during Ly Anh Tong's rule in order to engage in commerce. The usurpation of the Ly occurred after they married with the fishing Fujianese Tran family. In 1257 the Trần dynasty was faced with the first Mongol invasion of Đại Việt. At the beginning of the war, the Đại Việt army suffered several defeats by an overwhelming force that had already conquered a vast area in Asia. Several high-ranking officials of the Trần dynasty were so fearful that Prince Khâm Thiên Trần Nhật Hiệu, the younger brother of Thái Tông, even suggested to the Emperor that they might escape from Đại Việt to the Song dynasty. Due to the firm faith of Emperor Thái Tông, grand chancellor Trần Thủ Độ, and talented generals such as Prince Hưng Đạo Trần Quốc Tuấn and Lê Phụ Trần, the Trần dynasty was able to drive back the invasion and ultimately re-established the peace in Đại Việt in the twelfth lunar month of 1257. 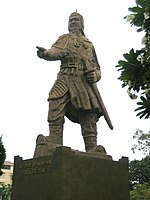 Statue of noble admiral Trần Quốc Tuấn. In the twelfth lunar month of 1284, the second Yuan invasion of Đại Việt was launched under the command of Kublai Khan's prince Toghon. Đại Việt was attacked from two directions, with Toghan himself conducting an infantry invasion from the northern border while the Yuan navy under general Sogetu advanced from the southern border through the territory of Champa. Initially, Trần Thánh Tông and Trần Nhân Tông had to order the army to retreat to avoid the pressure from the Yuan force when Prince Chiêu Minh Trần Quang Khải commanded his troops to try to stop Sogetu's fleet in the province of Nghệ An. Meanwhile, several high-ranking officials and members of the royal family of the Trần dynasty defected to the Yuan side, including Thánh Tông's own brother, Prince Chiêu Quốc (Trần Ích Tắc) and Trần Kiện, who was the son of Prince Tĩnh Quốc (Trần Quốc Khang). To ensure the safety of Thánh Tông and Nhân Tông during their retreat, Princess An Tư was offered as a present and diversion for prince Toghan, while Marquis Bảo Nghĩa (Trần Bình Trọng) was captured and later killed in the Battle of Đà Mạc defending the two emperors. At the southern border, Trần Quang Khải also had to retreat under the pressure of Sogetu's navy and the defection of the governor of Nghe An. This critical situation for the Trần dynasty began to change after their victory in the fourth lunar month of 1285 at the Battle of Hàm Tử, where the troops commanded by Trần Nhật Duật, Prince Chiêu Thành, Trần Quốc Toản, and Nguyễn Khoái were finally able to defeat the fleet of general Sogetu. On the tenth day of the fifth lunar month of 1285, Trần Quang Khải fought the decisive battle in the Chương Dương, where the Yuan navy was almost destroyed and the balance in the battlefield tilted definitively in favor of the Trần dynasty. Ten days later Sogetu was killed and the Trần Emperor Nhân Tông and Emperor Emeritus Thánh Tông returned to the capital, Thăng Long, on the sixth day of the sixth lunar month, 1285. In the third lunar month of 1287, the Yuan dynasty launched their third invasion of Đại Việt. This time, unlike the second invasion, commander-in-chief Prince Hưng Đạo (Trần Quốc Tuấn) assured the Emperor that Đại Việt's army could easily break the Yuan military campaign. This invasion was indeed ended one year later by a disastrous defeat of the Yuan navy at the Battle of Bạch Đằng on the eighth day of the third lunar month, 1288. Besides Trần Quốc Tuấn, other notable generals of the Trần dynasty during this time were Prince Nhân Huệ Trần Khánh Dư, who destroyed the logistics convoy of the Yuan navy at the Battle of Vân Đồn, and general Phạm Ngũ Lão, who took charge of ambushing prince Toghan's retreating troops. Professor Liam Kelley noted that people from Song dynasty China like Zhao Zhong and Xu Zongdao fled to Tran dynasty ruled Vietnam after the Mongol invasion of the Song and they helped the Tran fight against the Mongol invasion. The Tran dynasty originated from the Fujian region of China as did the Daoist cleric Xu Zongdao who recorded the Mongol invasion and referred to them as "Northern bandits". Reconstruction of a Trần-era cataphract. After the three invasions, the people of Đại Việt were finally able to enjoy a long period of prosperity and peace during the reigns of Trần Anh Tông, Trần Minh Tông, and Trần Hiến Tông. Anh Tông was the first Trần emperor to reign without facing attacks from the Mongol Empire. Despite the deaths of the two most important generals of the early Trần dynasty, Trần Quang Khải in 1294 and Trần Quốc Tuấn in 1300, the Emperor was still served by many efficient mandarins like Trần Nhật Duật, Đoàn Nhữ Hài, Phạm Ngũ Lão, Trương Hán Siêu, Mạc Đĩnh Chi, and Nguyễn Trung Ngạn. Anh Tông was very strict in suppressing gambling and corruption, but he also generously rewarded those who served him well. In 1306, the king of Champa, Chế Mân, offered Vietnam two Cham prefectures, Ô and Lý, in exchange for a marriage with the Vietnamese princess Huyền Trân. Anh Tông accepted this offer, then took and renamed Ô prefecture and Lý prefecture to Thuận prefecture and Hóa prefecture. These two prefectures soon began to be referred to collectively as the Thuận Hóa region. Only one year into the marriage, Chế Mân died and, in line with the royal tradition of Champa, Huyền Trân was to be cremated with her husband. Facing this urgent condition, Anh Tông sent his mandarin Trần Khắc Chung to Champa to save Huyền Trân from an imminent death. Finally Huyền Trân was able to return to Đại Việt, but Chế Chí, the successor of Chế Mân, no longer wished to abide by the peace treaty with Đại Việt. After that event, Anh Tông himself, along with the generals Trần Quốc Chân and Trần Khánh Dư, commanded three groups of Đại Việt military units to attack Champa in 1312. Chế Chí was defeated and captured in this invasion, and Anh Tông installed a hand-picked successor, but the relations between Đại Việt and Champa remained strained for a long time afterwards. After the death of the Retired Emperor Trần Minh Tông in 1357, the Trần dynasty began to fall into chaos during the reign of Trần Dụ Tông. While being modest and diligent under the regency of Minh Tông, the reign of Emperor Dụ Tông saw extravagant spending on the building of several luxurious palaces and other indulgences. Dụ Tông introduced theatre, which was considered at the time to be a shameful pleasure, into the royal court. The Emperor died on the 25th day of the fifth lunar month, 1369, at the age of 28, after appointing his brother's son Dương Nhật Lễ despite the fact that his appointee was not from the Trần clan. Like his predecessor Dụ Tông, Nhật Lễ neglected his administrative duties and concentrated only on drinking, theatre, and wandering. He even wanted to change his family name back to Dương. Such activities disappointed everyone in the royal court. This prompted the Prime Minister Trần Nguyên Trác and his son Trần Nguyên Tiết to plot the assassination of Nhật Lễ, but their conspiracy was discovered by the Emperor and they were killed afterwards. In the tenth lunar month of 1370, the Emperor's father-in-law, Trần Phủ, after receiving advice from several mandarins and members of the royal family, decided to raise an army for the purpose of overthrowing Nhật Lễ. After one month, his plan succeeded and Trần Phủ became the new emperor of Đại Việt, ruling as Trần Nghệ Tông, while Nhật Lễ was downgraded to Duke of Hôn Đức (Hôn Đức Công) and was killed afterwards by an order of Nghệ Tông. After the death of Hôn Đức Công, his mother fled to Champa and begged King Chế Bồng Nga to attack Đại Việt. Taking advantage of his neighbour's lack of political stability, Chế Bồng Nga commanded troops and directly assaulted Thăng Long, the capital of Đại Việt. The Trần army could not withstand this attack and the Trần royal court had to escape from Thăng Long, creating an opportunity for Chế Bồng Nga to violently loot the capital before withdrawing. In the twelfth lunar month of 1376 the Emperor Trần Duệ Tông decided to personally command a military campaign against Champa. Eventually, the campaign was ended by a disastrous defeat of Đại Việt's army at the Battle of Đồ Bàn, when the Emperor himself, along with many high-ranking madarins and generals of the Trần dynasty, were killed by the Cham forces. The successor of Duệ Tông, Trần Phế Đế, and the retired Emperor Nghệ Tông, were unable to drive back any invasion of Chế Bồng Nga in Đại Việt. As a result, Nghệ Tông even decided to hide money in Lạng Sơn, fearing that Chế Bồng Nga's troops might assault and destroy the royal palace in Thăng Long. In 1389 general Trần Khát Chân was appointed by Nghệ Tông to take charge of stopping Champa. In the first lunar month of 1390, Trần Khát Chân had a decisive victory over Champa which resulted in the death of Chế Bồng Nga and stabilised situation in the southern part of Đại Việt. During the reign of Trần Nghệ Tông, Hồ Quý Ly, an official who had two aunts entitled as consorts of Minh Tông, was appointed to one of the highest positions in the royal court. Despite his complicity in the death of the Emperor Duệ Tông, Hồ Quý Ly still had Nghệ Tông's confidence and came to hold more and more power in royal court. Facing the unstoppable rise of Hồ Quý Ly in the court, the Emperor Trần Phế Đế plotted with minister Trần Ngạc to reduce Hồ Quý Ly's power, but Hồ Quý Ly pre-empted this plot by a defamation campaign against the Emperor which ultimately made Nghệ Tông decide to replace him by Trần Thuận Tông and downgrade Phế Đế to Prince Linh Đức in December 1388. Trần Nghệ Tông died on the 15th day of the twelfth lunar month, 1394 at the age of 73 leaving the royal court in the total control of Hồ Quý Ly. He began to reform the administrative and examination systems of the Trần dynasty and eventually obliged Thuận Tông to change the capital from Thăng Long to Thanh Hóa in January 1397. On the full moon of the third lunar month, 1398, under pressure from Hồ Quý Ly, Thuận Tông, had to cede the throne to his three-year-old son Trần An, now Trần Thiếu Đế, and held the title Retired Emperor at the age of only 20. Only one year after his resignation, Thuận Tông was killed on the orders of Hồ Quý Ly. Hồ Quý Ly also authorised the execution of over 370 persons who opposed his dominance in the royal court, including several prominent mandarins and the Emperor's relatives together with their families, such as Trần Khát Chân, Trần Hãng, Phạm Khả Vĩnh and Lương Nguyên Bưu. The end of the Trần dynasty came on the 28th day of the second lunar month (Gregorian: March 23) 1400, when Hồ Quý Ly decided to overthrow Thiếu Đế and established a new dynasty, the Hồ dynasty. Being Hồ Quý Ly's own grandson, Thiếu Đế was downgraded to Prince Bảo Ninh instead of being killed like his father.The Hồ clan originated in Zhejiang province of China. To restore the country's economy, which had been heavily damaged during the turbulent time at the end of the Lý dynasty, Emperor Trần Thái Tông decided to reform the nation's system of taxation by introducing a new personal tax (thuế thân), which was levied on each person according to the area of cultivated land owned. For example, a farmer who owned one or two mẫu, equal to 3,600 to 7,200 square metres (39,000 to 78,000 sq ft), had to pay one quan per year, while another with up to four mẫus had to pay two quan. Besides personal taxes, farmers were obliged to pay a land tax in measures of rice that was calculated by land classification. One historical book reveals that the Trần dynasty taxed everything from fish and fruits to betel. Taxpayers were divided into three categories: minors (tiểu hoàng nam, from 18 to 20), adults (đại hoàng nam, from 20 to 60), and seniors (lão hạng, over 60). During the reign of Trần Thánh Tông members of the Trần clan and royal family were required by the Emperor to take full advantage of their land grants by hiring the poor to cultivate them. Đại Việt's cultivated land was annually ruined by river floods, so for a more stable agriculture, in 1244 Trần Thái Tông ordered his subordinates to construct a new system of levees along the Red River. Farmers who had to sacrifice their land for the diking were compensated with the value of the land. The Emperor also appointed a separate official to control the system. Towards the end of the Trần dynasty, Hồ Quý Ly held absolute power in the royal court, and he began to carry out his ideas for reforming the economy of Đại Việt. The most significant change during this time was the replacement of copper coins with paper money in 1396. It was the first time in the history of Vietnam that paper money was used in trading. (Đại Việt sử lược) History of Vietnam record . Lĩnh Nam chích quái,14th-century Vietnamese historical work written in Han scripts by Trần Thế Pháp. Wooden gate of Phổ Minh pagoda. Trần literature was considered superior to Lý literature in both quality and quantity. Initially, most members of the Trần clan were fishermen without any depth of knowledge. For example, Trần Thủ Độ, the founder of the Trần dynasty, was assessed in Đại Việt sử ký toàn thư as a man of superficial learning. After their usurpation of power from the Lý dynasty, however, Trần emperors and other princes and marquises always attached special importance to culture, especially literature. Two important schools of literature during the reign of the Trần dynasty were patriotic and Buddhist literature. To commemorate the victory of Đại Việt against the second Mongol invasion the grand chancellor Trần Quang Khải composed a poem, named Tụng giá hoàn kinh (Return to the capital), which was considered one of the finest examples of Vietnamese patriotic literature during the dynastic era. Patriotism in Trần literature was also represented by the proclamation Hịch tướng sĩ (Call of Soldiers), written by general Trần Quốc Tuấn, which was the most popular work of the hịch (appeal, call) form in Vietnamese literature. Besides members of the Trần clan, there were several mandarins and scholars who were well known for patriotic works such as Trương Hán Siêu, an eminent author of the phú form, or general Phạm Ngũ Lão with his famous poem Thuật hoài. As Buddhism was de facto the national religion of the Trần dynasty, there were many works of Trần literature that expressed the spirit of Buddhism and Zen, notably the works of the Emperor Trần Nhân Tông and other masters of Trúc Lâm School. Besides the literature created by the upper classes, folk narratives of myths, legends, and ghost stories were also collected in Việt Điện U Linh Tập by Lý Tế Xuyên and Lĩnh Nam chích quái by Trần Thế Pháp. These two collections held great value not only for folk culture but also for the early history of Vietnam. Trần literature had a special role in the history of Vietnamese literature for its introduction and development of Vietnamese language (Quốc ngữ) literature written in chữ nôm. Before the Trần dynasty, Vietnamese language was only used in oral history or proverbs. Under the rule of the Emperor Trần Nhân Tông, the Vietnamese language was used for the first time as the second language in official scripts of the royal court, besides Chinese. It was Hàn Thuyên, an official of Nhân Tông, who began to compose his literary works in the Vietnamese language, with the earliest recorded poem written in chữ Nôm in 1282. He was considered the pioneer who introduced chữ nôm in literature. After Hàn Thuyên, chữ Nôm was progressively used by Trần scholars in composing Vietnamese literature, such as Chu Văn An with the collection Quốc ngữ thi tập (Collection of national language poems) or Hồ Quý Ly who wrote Quốc ngữ thi nghĩa to explain Shi Jing in the Vietnamese language. The achievement of Vietnamese language literature during the Trần era was the essential basis for the development of this language in the subsequent literature of Vietnam. Bình Sơn tower in Vĩnh Khánh pagoda during Trần dynasty, Tam Sơn town, Lô river commune, Vĩnh Phúc province. Phoenix head. Terracotta, Trần-Hồ dynasty, 14th–15th century. Architectural decoration. National Museum of Vietnamese History, Hanoi. Lion figure. Terracotta, Trần-Hồ dynasty, 14th–15th century. Nghệ An province, central Vietnam. Architectural decoration. National Museum of Vietnamese History, Hanoi. The boy Buddha rising up from lotus. Crimson and gilded wood, Trần-Hồ dynasty, 14th–15th century. Statue for worship. National Museum of Vietnamese History, Hanoi. The Lý and Trần dynasties were considered the golden age of music and culture. Although it was still seen as a shameful pleasure at that time, theatre was rapidly developed towards the end of the Trần dynasty with the role of Lý Nguyên Cát (Li Yuan Ki), a captured Chinese soldier who was granted a pardon for his talent in theatre. It was Lý Nguyên Cát who imported many features of Chinese theatre in the performing arts of Đại Việt such as stories, costumes, roles, and acrobatics. For that reason, Lý Nguyên Cát was traditionally considered the founder of the art of hát tuồng in Vietnam, which is nowadays a challenged hypothesis because hát tuồng and Beijing opera were different in concepts such as the way of using painted faces, costumes, or theatrical conventions. The art of theatre was introduced to the royal court by Trần Dụ Tông and eventually the emperor even decided to cede the throne to Dương Nhật Lễ who was born to a couple of hát tuồng performers. To celebrate the victory over the Yuan invasion in 1288, Trần Quang Khải and Trần Nhật Duật created the Múa bài bông (dance of flowers) for a major three-day festival in Thăng Long. This dance has been handed down to the present and is still performed at local festivals in the northern region. Statue of noble scholar Mạc Đĩnh Chi of Tran dynasty who was the ancestor of emperor Mạc Đăng Dung. Although Buddhism was considered the national religion of the Trần dynasty, Confucianist education began to spread across the country. The principal curricula during this time were the Four Books and Five Classics, and Northern history, which were at the beginning taught only at Buddhist pagodas and gradually brought to pupils in private classes organized by retired officials or Confucian scholars. The most famous teacher of the Trần dynasty was probably Chu Văn An, an official in the royal court from the reign of Trần Minh Tông to the reign of Trần Dụ Tông, who also served as royal professor of Crown Prince Trần Vượng. During the reign of Trần Thánh Tông, the emperor also permitted his brother Trần Ích Tắc, a prince who was well known for his intelligence and knowledge, to open his own school at the prince's palace. Several prominent mandarins of the future royal court such as Mạc Đĩnh Chi and Bùi Phóng were trained at this school. The official school of the Trần dynasty, Quốc học viện, was established in June 1253 to teach Four Books and Five Classics to royal students (thái học sinh). The military school, Giảng võ đường, which focused on teaching about war and military manoeuvre, was opened in August of the same year. Together with this military school, the first Temple of Military Men (Võ miếu) was built in Thăng Long to worship Jiang Ziya and other famous generals. Seven years after the establishment of the Trần dynasty, the Emperor Trần Thái Tông ordered the first imperial examination, in the second lunar month of 1232, for royal students with the purpose of choosing the best scholars in Đại Việt for numerous high-ranking positions in the royal court. Two of the top candidates in this examination were Trương Hanh and Lưu Diễm. After another imperial examination in 1239, the Trần emperor began to establish the system of 7-year periodic examinations in order to select royal students from all over the country. The most prestigious title of this examination was tam khôi (three first laureates), which was composed of three candidates who ranked first, second, and third in the examination with the names respectively of trạng nguyên (狀元, exemplar of the state), bảng nhãn (榜眼, eyes positioned alongside) and thám hoa (探花, selective talent). The first tam khôi of the Trần dynasty were trạng nguyên Nguyễn Hiền, who was only 12 at that time, bảng nhãn Lê Văn Hưu who later became a royal historian of the Trần dynasty, and thám hoa Đặng Ma La. In the 1256 examination, the Trần dynasty divided the title trạng nguyên into two categories, kinh trạng nguyên for candidates from northern provinces and trại trạng nguyên for those from two southern provinces: Thanh Hóa and Nghệ An, so that students from those remote regions could have the motivation for the imperial examination. This separation was abolished in 1275 when the ruler decided that it was no longer necessary. In 1304, the Emperor Trần Anh Tông decided to standardize the examination by four different rounds in which candidates were eliminated step by step through tests of classical texts, Confucianist classics, royal document redaction, and finally argument and planning. This examining process was abandoned in 1396 by the Emperor Trần Thuận Tông under pressure from Hồ Quý Ly, who replaced the traditional examination with the new version as a part of his radical reforms of the social and administrative system. Hồ Quý Ly regulated the imperial examination by a prefectural examination (thi hương) and a metropolitan examination (thi hội) following in the next year. The second-degree examination included four rounds: literary dissertation, literary composition, royal document redaction, and eventually an essay which was evaluated by the Emperor in person. For the lower-ranking officials, the emperor had another examination which tested writing and calculating, such as the examination in the sixth lunar month of 1261 during the reign of Trần Thánh Tông. There is evidence for the use of feng shui by Trần dynasty officials, such as in 1248 when Trần Thủ Độ ordered several feng shui masters to block many spots over the country for the purpose of protecting the newly founded Trần dynasty from its opponents. Achievements in science during the Trần dynasty were not detailed in historical accounts, though a notable scientist named Đặng Lộ was mentioned several times in Đại Việt sử kí toàn thư. It was said that Đặng Lộ was appointed by Retired Emperor Minh Tông to the position of national inspector (liêm phóng sứ) but he was noted for his invention called lung linh nghi which was a type of armillary sphere for astronomic measurement. From the result in observation, Đặng Lộ successfully persuaded the emperor to modify the calendar in 1339 for a better fit with the agricultural seasons in Đại Việt. Marquis Trần Nguyên Đán, a superior of Đặng Lộ in the royal court, was also an expert in calendar calculation. Near the end of the Trần dynasty the technology of gunpowder appeared in the historical records of Đại Việt and was responsible for the death of the King of Champa, Chế Bồng Nga, after the Trần general Trần Khát Chân fired a cannon at his battleship in January 1390. According to the NUS researcher Sun Laichen, the Trần dynasty acquired gunpowder technology from China and effectively used it to change the balance of power between Đại Việt and Champa in favour of Đại Việt. As a result of this Sun reasoned that the need for copper for manufacturing firearms was probably another reason for the order of Hồ Quý Ly to change from copper coins to paper money in 1396. The people of the Trần dynasty and later Hồ dynasty were not satisfied with the imported technology and continued to improve their firearms using gunpowder. The development of Đại Việt technology in using gunpowder resulted in weapons of superior quality to their Chinese counterparts. These were acquired by the Ming dynasty in their invasion of Đại Việt. During the rule of the Trần dynasty, medicine had a better chance to develop because of a more significant role of Confucianism in society. In 1261, the emperor issued an order to establish the Institute of Royal Physicians (Thái y viện) which took charge of managing medicine in Đại Việt, carrying out the examination for new physicians and treating people during disease epidemics. In 1265 the institute distributed a pill named Hồng ngọc sương to the poor, which they considered able to cure many diseases. Besides the traditional Northern herbs (thuốc Bắc), Trần physicians also began to cultivate and gather various regional medicinal herbs (thuốc Nam) for treating both civilians and soldiers. During the reign of Trần Minh Tông the head of the Institute of Royal Physicians Phạm Công Bân was widely known for his medical ethics, treating patients regardless of their descent with his own medicine made from regional herbs; it was said that Phạm Công Bân gathered his remedies in a medical book named Thái y dịch bệnh (Diseases by the Royal Physician). Another Trần person and fellow countryman of Phạm Công Bân was the monk Tuệ Tĩnh, one of the most famous physicians in Vietnamese history, who was called "Father of the Southern Medicine" for creating the basis of Vietnamese traditional medicine with his works Hồng nghĩa giác tư y thư and Nam dược thần hiệu. Nam dược thần hiệu was a collection of 499 manuscripts about local herbs and ten branches of treatment with 3932 prescriptions to cure 184 type of diseases while Hồng nghĩa giác tư y thư provided people with many simple, easy-to-prepare medicines with high effect. ^ a b Taylor 2013, p. 120. ^ a b ed. Hall 2008 Archived August 27, 2016, at the Wayback Machine, p. 159 Archived September 12, 2016, at the Wayback Machine. ^ "Ham sắc, Tô Trung Từ tự hại mình". Retrieved 2017-03-09. ^ Chapuis, Oscar (1995). A history of Vietnam: from Hong Bang to Tu Duc. Greenwood Press. p. 85. ISBN 0-313-29622-7. ^ Taylor 2013 Archived September 12, 2016, at the Wayback Machine, p. 103. ^ Gunn 2011 Archived August 21, 2016, at the Wayback Machine, p. 112. ^ Woodside 1971 Archived August 21, 2016, at the Wayback Machine, p. 8. ^ Womack 2006 Archived June 3, 2016, at the Wayback Machine, p. 121. ^ a b Ngô Sĩ Liên 1993, p. 159. ^ a b c Ngô Sĩ Liên 1993, p. 153. ^ Ngô Sĩ Liên 1993, p. 154. ^ Ngô Sĩ Liên 1993, p. 156. ^ Ngô Sĩ Liên 1993, p. 157. ^ Ngô Sĩ Liên 1993, pp. 157–158. ^ Chapuis 1995, p. 79. ^ Ngô Sĩ Liên 1993, p. 160. ^ Chapuis 1995, p. 80. ^ a b c Ngô Sĩ Liên 1993, p. 163. ^ Ngô Sĩ Liên 1993, pp. 161–162. ^ a b c d e Trần Trọng Kim 1971, p. 50. ^ Trần Trọng Kim 1971, p. 49. ^ Ngô Sĩ Liên 1993, pp. 164–166. ^ National Bureau for Historical Record 1998, pp. 195–196. ^ Geoffrey C. Gunn (1 August 2011). History Without Borders: The Making of an Asian World Region, 1000–1800. Hong Kong University Press. pp. 112–. ISBN 978-988-8083-34-3. ^ K. W. Taylor (9 May 2013). A History of the Vietnamese. Cambridge University Press. pp. 120–. ISBN 978-1-107-24435-1. ^ Kenneth R. Hall (2008). Secondary Cities and Urban Networking in the Indian Ocean Realm, C. 1400–1800. Lexington Books. pp. 159–. ISBN 978-0-7391-2835-0. ^ Hall (1 January 1955). Secondary Cities & Urban Networking in the Indian Ocean Realm, c. 1400–1800. Lexington Books. pp. 159–. ISBN 978-0-7391-3043-8. ^ Jayne Werner; John K. Whitmore; George Dutton (21 August 2012). Sources of Vietnamese Tradition. Columbia University Press. pp. 29–. ISBN 978-0-231-51110-0. ^ Ngô Sĩ Liên 1993, p. 173. ^ Ngô Sĩ Liên 1993, pp. 172–173. ^ Chapuis 1995, p. 81. ^ Trần Trọng Kim 1971, p. 51. ^ Ngô Sĩ Liên 1993, pp. 189–190. ^ Ngô Sĩ Liên 1993, p. 193. ^ Ngô Sĩ Liên 1993, p. 192. ^ a b Chapuis 1995, p. 83. ^ Trần Trọng Kim 1971, p. 58. ^ Ngô Sĩ Liên 1993, pp. 192–195. ^ Ngô Sĩ Liên 1993, p. 195. ^ Ngô Sĩ Liên 1993, pp. 196–198. ^ Ngô Sĩ Liên 1993, p. 197. ^ Trần Trọng Kim 1971, p. 61. ^ Chapuis 1995, p. 84. ^ Delgado, James P. (2009). Khubilai Khan's Lost Fleet: In Search of a Legendary Armada. University of California Press. pp. 161–162. ISBN 0-520-25976-9. ^ Trần Trọng Kim 1971, p. 62. ^ Trần Trọng Kim 1971, p. 65. ^ Ngô Sĩ Liên 1993, p. 205. ^ Ngô Sĩ Liên 1993, p. 207. ^ a b Chapuis 1995, p. 85. ^ Ngô Sĩ Liên 1993, p. 223. ^ Trần Trọng Kim 1971, p. 66. ^ Chapuis 1995, p. 86. ^ Ngô Sĩ Liên 1993, pp. 258–259. ^ Trần Trọng Kim 1971, p. 69. ^ a b Chapuis 1995, p. 89. ^ Ngô Sĩ Liên 1993, p. 259. ^ Ngô Sĩ Liên 1993, pp. 262–263. ^ Chapuis 1995, pp. 89–90. ^ Ngô Sĩ Liên 1993, p. 250. ^ Trần Trọng Kim 1971, p. 70. ^ Ngô Sĩ Liên 1993, pp. 269–270. ^ Ngô Sĩ Liên 1993, p. 273. ^ Chapuis 1995, p. 91. ^ Ngô Sĩ Liên 1993, p. 281. ^ a b Ngô 1993, pp. 282–283. ^ Chapuis 1995, p. 90. ^ Ngô Sĩ Liên 1993, p. 270. ^ Ngô Sĩ Liên 1993, pp. 278–279. ^ Chapuis 1995, p. 94. ^ Ngô 1993, pp. 287–288. ^ Ngô 1993, pp. 288–291. ^ Ngô Sĩ Liên 1993, p. 292. ^ Ngô Sĩ Liên 1993, p. 294. ^ Ngô Sĩ Liên 1993, pp. 294–295. ^ a b Ngô Sĩ Liên 1993, p. 296. ^ Chapuis 1995, p. 96. ^ Taylor 2013 Archived November 25, 2016, at the Wayback Machine, p. 166. ^ ed. Hall 2008 Archived November 25, 2016, at the Wayback Machine, p. 161. ^ a b Chapuis 1998, p. 80. ^ a b Chapuis 1998, p. 81. ^ a b c Ngô Sĩ Liên 1993, p. 179. ^ Chapuis 1998, p. 95. ^ Trần Trọng Kim 1971, p. 73. ^ Dương Quảng Hàm 1968, pp. 232–238. ^ Ngô Sĩ Liên 1993, p. 178. ^ a b Trần Trọng Kim 1971, p. 53. ^ Tham Seong Chee 1981, pp. 304–305. ^ Tham Seong Chee 1981, p. 305. ^ Tham Seong Chee 1981, pp. 312–313. ^ a b c Lê Mạnh Thát. "A Complete Collection of Trần Nhân Tông's Works". Thuvienhoasen.org. Archived from the original on December 2, 2008. Retrieved 2009-12-10. ^ Dror, Olga (1997). Cult, culture, and authority: Princess Liễu Hạnh in Vietnamese history. University of Hawaii Press. pp. 14–28. ISBN 0-8248-2972-7. ^ Dương Quảng Hàm 1968, p. 292. ^ Kevin Bowen; Ba Chung Nguyen; Bruce Weigl (1998). Mountain river: Vietnamese poetry from the wars, 1948–1993 : a bilingual collection. Univ of Massachusetts Press. pp. xxiv. ISBN 1-55849-141-4. ^ "Hàn Thuyên". Từ điển Bách khoa toàn thư Việt Nam (in Vietnamese). Archived from the original on 2011-07-16. Retrieved 2009-12-10. ^ Dương Quảng Hàm 1968, p. 294. ^ a b Terry E. Miller, Sean Williams 2008, p. 249. ^ Terry E. Miller, Sean Williams 2008, p. 274. ^ Terry E. Miller, Sean Williams 2008, pp. 278–279. ^ a b c Trương Hữu Quýnh, Đinh Xuân Lâm, Lê Mậu Hãn 2008, p. 261. ^ Ngô Sĩ Liên, p. 263. ^ Ngô Sĩ Liên 1993, p. 180. ^ Ngô Sĩ Liên 1993, p. 171. ^ Adriano (di St. Thecla), Olga Dror (2002). Opusculum de sectis apud Sinenses et Tunkinenses: A small treatise on the sects among the Chinese and Tonkinese. Olga Dror (trans.). SEAP Publications. p. 128. ISBN 0-87727-732-X. ^ Ngô Sĩ Liên 1993, pp. 168–169. ^ "Nguyễn Hiền" (in Vietnamese). Từ điển Bách khoa toàn thư Việt Nam. Archived from the original on 2011-07-16. Retrieved 2009-12-09. ^ a b "Lê Văn Hưu" (in Vietnamese). Từ điển Bách khoa toàn thư Việt Nam. Archived from the original on 2011-07-16. Retrieved 2009-12-09. ^ a b Ngô Sĩ Liên 1993, p. 168. ^ a b c Ngô Sĩ Liên 1993, p. 172. ^ a b Ngô Sĩ Liên 1993, p. 217. ^ Ngô Sĩ Liên 1993, p. 289. ^ a b Ngô Sĩ Liên 1993, p. 176. ^ a b Ngô Sĩ Liên 1993, p. 233. ^ a b c Mai Hồng 1989, p. 20. ^ Ngô Sĩ Liên 1993, p. 166. ^ Ngô Sĩ Liên 1993, p. 182. ^ Ngô Sĩ Liên 1993, p. 267. ^ Ngô Sĩ Liên 1993, p. 169. ^ Ngô Sĩ Liên 1993, p. 234. ^ "Đặng Lộ" (in Vietnamese). Từ điển Bách khoa toàn thư Việt Nam. Archived from the original on 2011-07-16. Retrieved 2009-12-08. ^ Ngô Sĩ Liên 1993, p. 246. ^ "Trần" (in Vietnamese). Từ điển Bách khoa toàn thư Việt Nam. Archived from the original on 2011-07-16. Retrieved 2009-12-08. ^ Tuyet Nhung Tran, Anthony J. S. Reid 2006, pp. 75–77. ^ Tuyet Nhung Tran, Anthony J. S. Reid 2006, p. 77. ^ Tuyet Nhung Tran, Anthony J. S. Reid 2006, pp. 89–90. ^ a b c Alan Kam-leung Chan, Gregory K. Clancey,Hui-Chieh Loy 2001, p. 265. ^ Jan Van Alphen; Anthony Aris (1995). Oriental medicine: an illustrated guide to the Asian arts of healing. Serindia Publications, Inc. pp. 210–214. ISBN 0-906026-36-9. ^ Ngô Sĩ Liên 1993, p. 257. ^ Phạm Văn Sơn 1983, p. 215. ^ Nguyễn Xuân Việt (2008-12-26). "Y học cổ truyền của tỉnh Hải Dương trong hiện tại và tương lai" (in Vietnamese). Haiduong Department of Science and Technology. Archived from the original on 2013-04-19. Retrieved 2009-12-09. ^ a b "Tuệ Tĩnh" (in Vietnamese). Từ điển Bách khoa toàn thư Việt Nam. Archived from the original on 2011-07-16. Retrieved 2009-12-09. ^ Alan Kam-leung Chan, Gregory K. Clancey,Hui-Chieh Loy 2001, pp. 265–266.